Stakes placed Za Za Gabor (4 m O’Reilly – Zaza Top, by Lomitas), an impressive three length course winner when resuming, made an authoritative step up to win the $15,000 Rating 65 1600 metres on 3 February at Matamata. Owned and bred by Kevin Hickman ONZM, principal of Valachi Downs, and trained locally by Mike Moroney and Pam Gerard, Za Za Gabor ended her previous campaign with a second in the Warstep Stakes (Listed, 2000m), scored fresh-up over 1400 metres, and certainly appears on an upward plane. From the outside gate (9), rider Cameron Lammas had Za Za Gabor up to second at the 1200m, with the leader in his sights at the 600m and she quickened to a four length advantage after taking over at the 300m before winning easily by two lengths. Commentator George Simon said: “You only wanted to be on one horse at the corner and that was Za Za Gabor”. On footing upgraded to Dead4 a race earlier, Za Za Gabor ran the 1600 metres in 1:35.6, last 600m in 35.6, and paid $3.20 & $1.50 on the NZ TAB. The race was sponsored in conjunction by Comag and Fasttrack Insurance. The latter company was responsible for adding $5,000 to the prize money and CEO David Archer said that $1 million in additional prize money was realistic within two years and in time it could increase to $5 million. “We’re getting the support of people in the racing industry and in return we’re helping to bolster stakes by giving it back,” he said. Valachi general manager Jonathan Scully said: “Thanks to Pam and her team. We really thought we had a listed win last season with this filly. She’s obviously got a fair bit of promise and we look forward to seeing her stepping up from here on. In addition to her somewhat untapped ability – coming to fruition with maturity – and exuding the action of a good quality galloper, Za Za Gabor also depth to her pedigree. Her dam, Zaza Top, was the Second Top filly on the German 2YO Handicaps and doing a really good job at stud, having already left Champion 3YO in Germany Zazou (Shamardal), and Zoe Dream (Galileo), winner of seven from 2300m to 4050m in France. 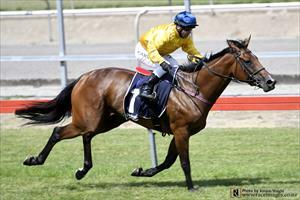 Valachi also sold her half-brother Doroza (Medaglia d’Oro) for $120,000 at Karaka. Bought by Matt Cumani and Phill Cataldo, Cumani has trained him to win in Australia. Za Za Gabor was strapped Eilish McCall.